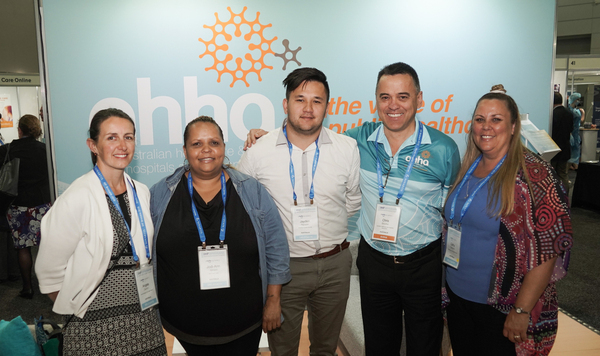 The Australian Healthcare and Hospitals Association, HESTA Australia and the Lowitja Institute were proud to provide four scholarship supported places for Australian Aboriginal and Torres Strait Islander Early Career Health Professionals to attend the 42nd World Hospital Congress. The scholarships’ aims were to help develop the careers of up and coming Aboriginal and Torres Strait Islander health professionals through the opportunity to fully participate at the 42nd World Hospital Congress from 10 to 12 October 2018 in Brisbane including by enabling them to hear from, and network with, international health executives and thought leaders. Four exceptional early career health professionals received the scholarship and attended the Congress. #hellomynameis... Cathy Davison and I am an Aboriginal Hospital Liaison Officer on the Central Coast of NSW. I was given the opportunity to attend the 42nd World Hospital Congress Conference in Brisbane, 2018. This was made available to me through a scholarship offered to me by AHHA. I was so grateful to have been awarded this scholarship and given the opportunity to attend this conference. To be truthful, wasn't sure what to expect from this conference. I thought that it may be a lot of talk that would go over my head, after all I am an Aboriginal Health Worker not a Doctor or CEO of an organisation. But wow, was I wrong! Everything spoken about at the conference really resonated with me and I was engrossed in all sessions that I attended. From the first session I attended about Trauma and Disaster response, I started to really think about the scale of something like this and how it would affect our healthcare system and the scale of organisation something like this would take. Value based healthcare and patient outcomes was a focus of this conference and being a patient advocate in my role I was really interested to hear different strategies and approaches to support our patients. I was particularly taken with patient stories and journeys and how from adversity and diversity monumental legacies were born. These stories reminded me why I do what I do and the study I am currently undertaking to become a Registered Nurse. I am in awe of these patients and their strengths and determination to overcome difficult situations. And of course being Aboriginal I was really keen for the Concurrent Session on Addressing inequality and cultural disadvantage: perspectives on improving health of Indigenous people. This session showed we are starting to make a difference but also identified we still have a long way to go to achieve better outcomes. It was also interesting to hear from other Indigenous communities from around the world and how similar our stories are. The conference really inspired me and motivated me to want to make change....even just the little things such as #hellomynameis... these are the things that make a difference to our patients and they don't take much time or money but make a world of difference to our patients. Thank you AHHA for providing me this wonderful experience that provided guidance and strategies to go forward and pursue better patient outcomes and good quality healthcare! I have been given a very unique opportunity to attend the 42nd World Health Congress held on the 10-12 of October 2018. The experience has been invaluable in to supporting my ongoing professional development in health. When I completed my Bachelor of Nursing degree I would never have imagined I could have chaired a session at an International Health forum. Addressing inequalities and cultural disadvantages: perspectives on improving the health of Indigenous people is fundamental to what I aim to achieve within my professional role. I truly appreciate the generous contributions that allowed my attendance and I would like to personally thank my sponsors. I will draw upon these experiences within my daily role as Clinical Nurse Specialist in Aboriginal Leadership and Development for Murrumbidgee Local Health District to provide a culturally safe and competent work place for my patients and colleagues.